GIVEAWAY: Enter to win a $50 Visa gift card for you and one to give to a friend (Ends 8/9/13 at 11:59 PM EST) | A Savings WOW! 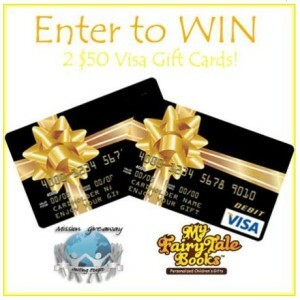 Grand Prize: A $50 Visa gift card for you and one to give to a friend! MyFairyTaleBooks™ is a personalized children’s gifts company based in Orange County, NY. They take special care with each and every order to make sure all information is correct and shipped out on time. Their customer service representatives are available to answer any and all questions you may have. They will work with you to make sure you receive the perfect personalized gift that the child in your life will enjoy forever! Take a look at Saving You Dinero’s recent review of MyFairyTaleBooks.